Summer is coming, and along with the sun comes countless celebrations around the state! Get out your calendar, grab your sash, and get ready! Century of Action has a very exciting events coming soon. May 31st from 6 to 8pm is the Statewide Exhibit Launch at the Oregon Historical Society. Tickets are available at the Century of Action website now! I will be on hand with sashes if you have not had the opportunity to buy yours! Looking ahead to the next few months there are quite a few fun events happening around the state, and each one of them is sash worthy. Let me tell you about a few of the big ones. Late May and early June are packed full of Portland Rose Festival events including the Grand Floral Parade on Saturday June 9th. If you plan on attending be sure to bring your sash and a camera along to capture the moment! The 30th annual Eugene Celebration will be taking place August 24-26 in downtown Eugene. The three day long celebration has countless sash worthy moments! This year the Pendleton Round-Up is September 12-15 out in Pendleton Oregon. We know the Rodeo Queens will be wearing their sashes, why not wear yours too? The 52nd annual Scandinavian Festival in Junction City is August 9-12. Located just North of Eugene, the Scandinavian Festival is packed with cultural foods, music, clothing and dance. If you haven’t been, it’s worth the drive! The State Fair is August 24-September 3rd. 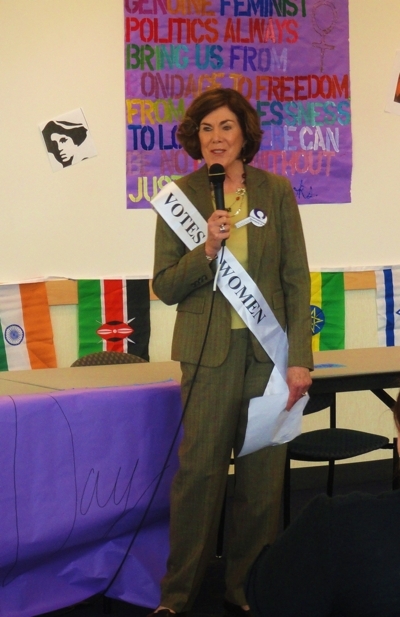 Celebrate Oregon, and Suffrage! In addition to all of these great events don’t forget about all the 4th of July celebrations. I know Independence and Medford go all out for Independence Day! Also, check out your county fair this summer to have more fun times in your sash! 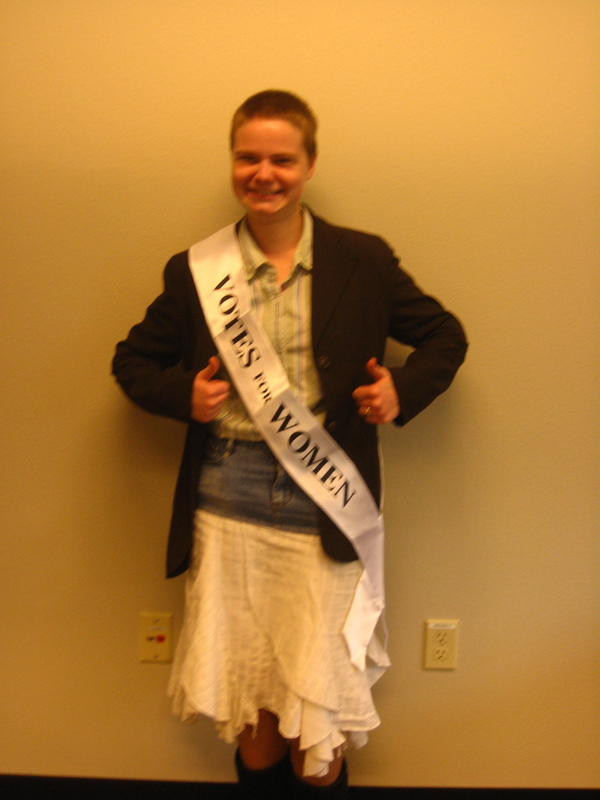 WOU Student Alyssa Palmer gives summer, and Votes for Women, two thumbs up! 100 years after Oregon women won the right to vote and run in elections we are still experiencing political firsts. Today women make up half of the US population but only make up about 17% of the US House and Congress. In the past 100 years Oregon has only had 6 women serve in the US Congress. 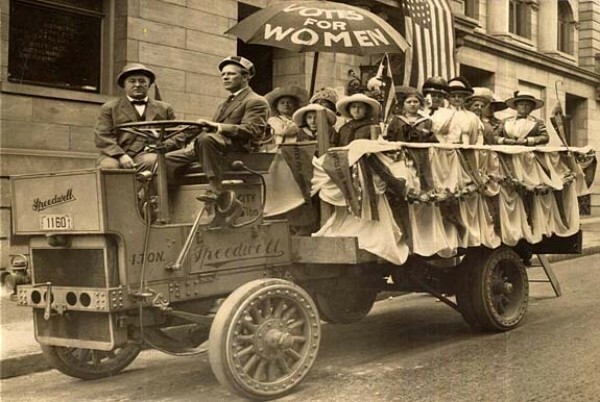 Washington gained equal suffrage in 1910, and they have only elected 9 women to Congress. Vermont still has not elected a single woman to the US Congress. Looking around the state of Oregon we can see many firsts. Recently Suzanne Bonamici was elected to the US House, and although she is not the first woman Representative from our state, we have not had a woman in Congress since Representative Elizabeth Furse left the House in 1999. Here in Polk County we can see another first. Jennifer Wheeler is the first woman Commissioner to serve Polk County. Wheeler served as the Secretary to the Board of Commissioners prior to seeking election after the death of Commissioner Mike Propes in March of 2011. I had the honor to ask Commissioner Wheeler some questions about her life and what it is like being the first woman Polk County Commissioner. 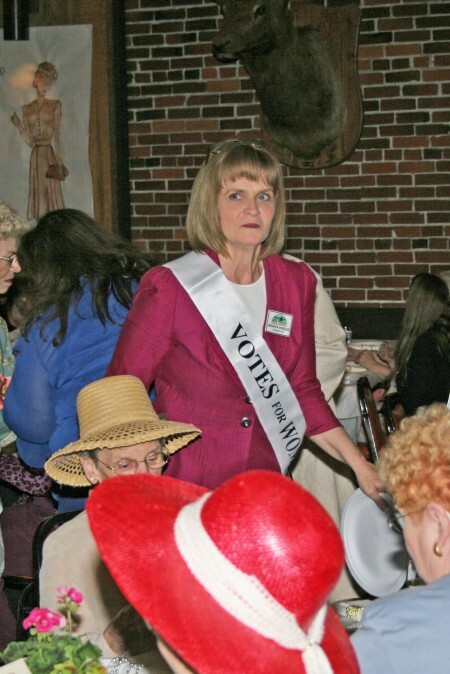 Below is a photograph of the Commissioner in her ‘Votes for Women’ sash. Thank you Commissioner Wheeler for your participation in The Sash Project! Keep sending in pictures and fighting for more firsts! Century of Action is working to commemorate and preserve Oregon Women history, but there are countless other stories to be told in Oregon. Our state has a great and long history chalk full of interesting history just waiting to be explored. We received a photo awhile ago showing Leesa Gratrea wearing the sash at the Kam Wah Chung museum in John Day Oregon. Before seeing this photo I had not heard of Kam Wah Chung, and decided to do a bit of research on the historic site. Kam Wah Chung is a museum in western Oregon preserving the history of the Chinese workforce in Oregon. The museum houses artifacts and displays depicting the life of the Chinese worker. The building itself was built as a trading post on The Dalles Military Road in the mid 1800s. It later became the center of the Chinese community as a store and apothecary. Ing Hay, known as Doc Hay, and Lung On ran the store and used traditional Chinese methods of medicine to heal those in their community. The building was abandoned after Ing Hay died, and in his will he left the building to the city of John Day providing that it be turned into a museum. Today the museum houses one of the most extensive collections of history of Chinese immigrants in the west and was listed on the National Register of Historic Places in 1973 and became a National Historic Landmark in 2005. The Oregon State Parks website has information about all of the state parks and museums in Oregon, and has hours of operation for all of the locations. Oregon is full of fascinating history. From the Oregon Trail up until today Oregonians have been making history and preserving the stories of those who didn’t live to tell it. 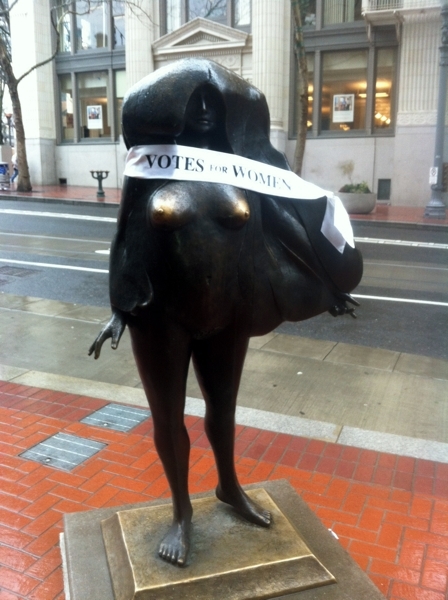 While the Sash Project is shedding light on Oregon Women Suffrage, we don’t have to stop there. Throughout this state we have countless historical sites, museums, and natural landmarks. Take the sash with you where ever you go, you never know when a photo opportunity will come up! The Sashes are in the mail! Starting soon six universities in Oregon will be participating in the sash project! Eastern Oregon University, Southern Oregon University, Western Oregon University, Portland State University, Oregon State University and The University of Oregon will all have sashes circulating around their campuses. Each student who receives the sash is encouraged to photograph themselves in it, learn a little more about women suffrage, and then pass it on! At Portland State University Kari Anne McDonald, who works in the Women’s Resource Center, received the sash. The center will be having their Take Back the Night event on Thursday, and will be sashing those who attend. The Associated Students of Oregon State University will be passing their sash around, getting their fellow students involved in the Sash Project, and educated about the Oregon Suffrage movement. 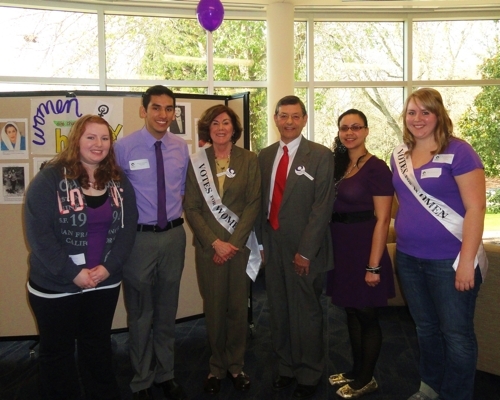 The Women’s Resource Centers at Southern Oregon University will also be receiving sashes in the mail any day! Here at Western Oregon University the sash has already begun its trip around our beautiful campus, and we hope to see pictures soon! Keep checking back to read about more updates, see more pictures, and learn more about this project. For those of you who do not attend one of the participating schools, sashes are available for purchase here on the Century of Action website. Woman Suffrage isn’t just an issue here in the United States, but an international issue. Women here in Oregon have been able to vote for 100 years, but in many countries around the world that right was won much later on. The US suffrage movement wasn’t the only one happening in the early parts of the 20th century. Women in Albania, Slovakia and the Czech Republic all won equal suffrage in 1920. In the following years a multitude of countries including Sweden, Armenia, Azerbaijan, gave women the right to vote, and in some cases the right to run for elected positions. While the Sash Project is focusing on Oregon and our suffrage movement, it does not have to end here. Women around the globe are still facing discrimination and oppression. In our own country women’s rights are being challenged daily. ‘Votes for Women’ represents more than just the right to cast a ballot; it is a reminder of the constant struggle women face for equality. Another photo was sent to us of Margarete Jaeger who is currently a Peace Corp Volunteer in Jordan working with special needs children. 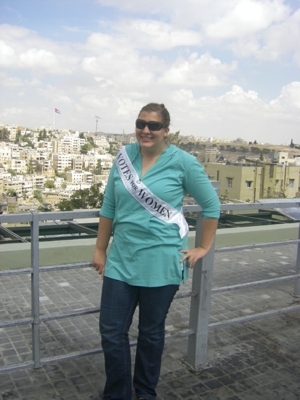 This photo is taken in Amman, Jordan. Countries like Egypt, Syria and Lebanon have been in the news over the past couple of years due to political upheaval and women have played important and courageous roles in these demonstrations. It is important for us to not only celebrate and remember the victories here at home, but to remember the women home and abroad that are still fighting for their rights. A lot has been accomplished, but the battle is nowhere near over. Continue sharing your pictures, and be sure to check out our Flickr group to check out the newly added photos! Those of us whose families have been in Oregon for a few generations have a chance of finding a connection like Heidi did. In the process of working on the Documents Project last year one of my classmates came across a woman with the same last name as me. Helen Gillespie worked on the campaign in 1912. She was part of the ‘Flying Squadron’, a group that traveled in a 70 mile circle around Portland campaigning for suffrage. I have not yet determined if I am related to her, but knowing that my family may have been involved in the final campaign only increases my interest in this movement, and my passion for the wonderful work that Century of Action is doing. Use the documents projects to search for your family names! All of the newspaper articles that were used have been transcribed so that you can search them, making your investigation even easier! Let us know if you find any connections, and if you know any stories of women or men during the campaign, feel free to share them with us! And keep taking pictures in your sashes and posting them or sharing them with us. People have been asking, “What does a sash have to do with suffrage?” and the answer is surprising, and inspiring at the same time. In her book Selling Suffrage: Consumer Culture & Votes for Women Margaret Finnegan not only does a fabulous job of describing and evaluating the suffrage movement in the United States, but she also discusses the tactics and strategies used by the new wave of suffragists. After several failed attempts to have the suffrage amendment passed many of the new suffragists of the early 20th century began looking at new ways to further their cause. One of these new tactics was using window fronts in stores to display suffrage. Women in California successfully used this method in their 1911 campaign. Women in New York City used store fronts to advertise their cause, and catch the attention of passersby. Suffragists also began to purchase billboards and other large scale advertising in many of the big cities. In addition to these means of advertising suffragists planned parades, speeches, and other social events. They were no longer working behind closed doors, but taking this issue to the streets and placing it in front of the public. Wearing sashes was part of this new effort. Using propaganda, such as a sash, gained a lot of attention, and got people talking. This is why we are using these sashes. We don’t need to get an amendment passed, luckily that hard work has already been done, but we do have a mission to raise awareness so that women’s history is preserved. Gaining attention is the first step in getting people involved, and interested in this centennial celebration. We can’t sit behind closed doors and hope that people will take an interest; we must reach out to people and educate them on why 2012 is such an important year in Oregon. If you wear a sash in a public location you will be asked questions, it has happened to me countless times. Wear them with pride, and tell those curious people about the sashes, tell them why you are wearing yours today. International Women’s Day is celebrated around the world on March 8th. On this day women are recognized for their achievements, regardless of their differences; whether they be national, ethnic, linguistic, cultural, economic, or political. March 8th is a day to look back on the past struggles of women, all they have accomplished, and to look towards the future for the next generations of women. In 1977 the United Nations General Assembly adopted a resolution proclaiming a United Nations Day for Women’s Rights and International Peace to be observed. This was in an effort to recognize the important role of women, and to discourage discrimination against women. This day is observed in many different ways around the world, and each celebration is special and unique. Here at Western Oregon University we decided to make International Women’s Day a day to remember. I had been planning a small event for the Sash Project, but when I realized that three of my co-workers at the Associated Students of Western Oregon University (ASWOU) were also interested in the day, my small event suddenly became so much bigger. The day kicked off at 11 am with some opening remarks from Western Oregon University President Mark Weiss, and his wife Meg. Meg pulled from some inspirational Maya Angelou quotes, and encouraged all in attendance to find what they love to do in life. At noon we had an international student panel with individuals from a myriad of countries including India, Mexico, Saudi Arabia, and Ghana. The panel was extremely informative, and very fun for all who participated. At 2 o’clock we had an open mic where people were invited to recite poems, read essays, or sing songs. The participation was phenomenal. Throughout the day people were “sashed” and those photos will soon be available on Flickr. Meg Weiss really enjoyed the sashes and the Sash Project, and proudly sported her sash throughout the day. The event itself was a huge success, but it was not something I would have been able to accomplish on my own. Through partnerships and collaboration something small and seemingly insignificant can take on a whole new meaning and blossom into something extraordinary. I saw this happen when planning our International Women’s Day event, and looking back to the suffrage campaign evidence of that is everywhere. In the final push here in Oregon, many groups came together to work collectively and make their campaign stronger. It wasn’t always easy, and at times there was conflict between the groups. For example, the Portland Woman’s Club was instrumental in the suffrage campaign, but they did not agree with some of the practices of the other suffrage groups. Despite minor disagreements, multiple individuals or groups working towards the same cause will always gain more attention and more support than an individual ever could. The win in 1912 is often attributed to cooperation amongst the women and men of the various organizations, and their use of mass media and public relations methods. International Women’s Day 2012 was a great success, but don’t stop celebrating now! Keep sashing and sharing information about this centennial, and let’s see how working together can change the world! While wearing a sash around and taking pictures of all of your friends can be fun, don’t let the fun stop there! While we do recommend staying dressed while sashing, you don’t need to take the fun out of it! Sure, keep sashing everyone you know and taking pictures galore, but start thinking outside the box. Is there a historical or beloved statue in your town? Sash it! Next time you see your school mascot or team mascot, sash it! Happen to see a funny mannequin? Throw a sash on it and take a picture! 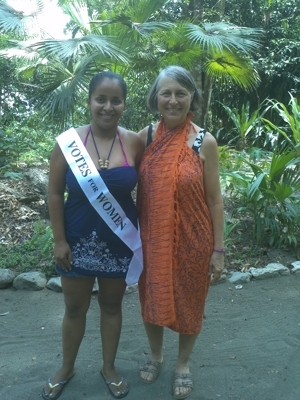 We encourage you to have fun with your sash, and help increase its visibility around the state! Those suffragists we admire so much certainly had to keep their sense of humor after seeing the suffrage amendment defeated five times before finally reaching success in their sixth and final attempt in 1912. Their tenacious spirit and determination got them through years of defeat, and all of their hard work paid off when they were finally able to cast a vote and run for public office. While searching the state for a proper statue or landmark to sash, this oldie but goodie from Portland was brought to my attention. Portland’s Mayor Bud Clark (1985-1992), the long-time owner of the Goose Hollow Inn Tavern is known as one of Portland’s most colorful politicians Like our suffragists, Bud was willing to go to great lengths for the things he believed in. The famous picture of Mayor Clark flashing the “Kvinneakt” statue was taken to call attention to the importance of art education. Now it’s time to call attention to a cause you believe in! Grab your sash and get out there in your community! Sash whatever you can to call attention to the work and accomplishments of all those hard working women 100 years ago! Don’t be afraid to do some crazy things! Remember, pictures say a thousand words, and a picture of a sash on a famous statue in your town will tell a wonderful story! Believe it or not, people of all ages love sashes! Sashes, along with all of the information available on the Century of Action website are great educational tools for the young, and the young at heart! For you teachers out there, or for those of you who know young Oregonians, we encourage you to teach them about this historical moment in time! 2012 will only come around this once, so use this opportunity to educate those around you! After years of defeats, Oregonian women were finally able to vote, and now 100 years later we get to celebrate their hard work and commemorate the victory of 1912. Bring sashes as show and tell, wear them with pride, and share this incredible story with your friends and family! Now is the time to celebrate and remember all that was done so that women today can vote and shape the world around them through their involvement with politics. Is there a young woman in your life who’d like to join Kate Stuckart (pictured above) and have her “sash photo” featured on our Facebook page?